Human impact on the natural world is often negative — overpopulation putting a strain on natural resources, global warming, pollution, the extinction of numerous species, etc. A prime example of “educated” wildlife can be found in the lakes that surround San Diego, CA. San Diego may have the most “intelligent” largemouth bass (Micropterus salmoides) on the planet! This is due to the “unnatural selection” that the bass population has experienced through human activity. Bass are not native to California. They originated from North America’s east coast and the southern states. Bass were planted in California waters well over 100 years ago. The lakes around San Diego are generally small but deep with gin-clear water. They receive a tremendous amount of “fishing pressure” (meaning a lot of anglers spend a lot of time fishing these lakes). The fish in the San Diego waters see a lot of different lures and baits dangled in front of their noses. Most San Diego lakes were stocked with “Florida strain” largemouth bass. Floridians are naturally harder to trick into biting a lure than the “northern strain” of the bass. No one knows why. The long-standing record for largemouth is 22 ¼ lbs. Many anglers think that the next world record bass is swimming in one of the San Diego lakes. In fact, we know that’s the case — a few years ago, Mac Weakley caught a 25+ lb. behemoth at Lake Dixon, a small body of water north of San Diego. Since that fish was not caught according to International Game Fish Association (IGFA) rules, it was not eligible to become an official record. Weakley released that fish back into Lake Dixon. Mike Winn holds the 25.1-pound bass caught by his friend Mac Weakley on Dixon Lake near San Diego, CA. The gargantuan size of San Diego’s fish keeps a steady stream of anglers visiting the area’s waters. Fishermen try new techniques and ever more realistic lures and presentations to get the wary fish to bite. Some of these techniques work well for a while. Then, the bass population seems to wise up and the effectiveness of the new techniques fade. One of a number of highly-realistic “swim baits” used to mimic the rainbow trout that are stocked in San Diego’s lakes during cooler months. Rainbows are a favorite bass dinner item. 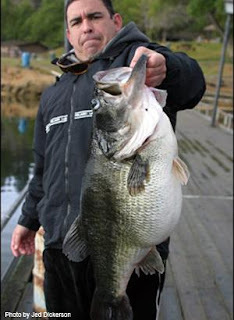 As noted in another blog entry, bass that are caught and released back to the water seem to learn from the experience. Perhaps they retain an association between what they were doing (attacking a lure) with the resulting experience of being hauled out of the water, unhooked and returned to the water. They tend to avoid making the same mistake again. Bass are regarded as a fairly intelligent group of fish, as indicated by the high degree of mobility their eyes have in their eye sockets. Due to the fishing pressure over the years, all of the more easily caught bass around San Diego were either harvested for the dinner table or caught and released. This left the less-easily caught fish to reproduce, creating generations of fish that became increasingly harder to fool by anglers. These hard to catch fish grew very large over time. 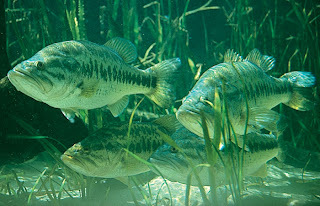 Unlike colder parts of the country where the water “gets hard” during the winter and cold-blooded bass greatly reduce their activity, the bass around San Diego grow year round in their moderate environment. These bass get easy calories to grow on during the winter when their lakes are stocked with rainbow trout. The trout, raised in hatcheries, are “naive” and are easy prey for the voracious largemouth bass. So, instead of experiencing little or no growth during the colder months, San Diego bass get larger. The water in the San Diego lakes is very clear, allowing fish to easily spot fishing line and notice differences between their natural live prey and lures. To test how sensitive bass are to fishing line, some anglers tossed live night crawler worms off a San Diego lake’s dock. The bass sheltering under the dock would rush out to consume the wriggling food. The fishermen then threaded virtually invisible 1# test clear monofilament fishing line through a night crawler and tossed it off the dock. There was no hook on the line or in the worm. The worm wiggled just like the others crawlers but the bass refused to touch it. Somehow, they either saw the line or otherwise sensed that there was something different/unnatural abut that particular crawler. The intense fishing pressure may also prompt the bass to use their senses in different ways than they might normally. Some years back I was fishing on Lake Miramar near San Diego and the bass were chasing schools of baitfish just under the surface of the water. There were splashes all around my boat as the bass charged up to engulf the shad trapped against the water’s surface. I was surrounded by other boats filled with fisherman. These anglers were casting a wide variety of baits at the schooling, feeding bass but the fish refused their offerings. Even in the midst of a feeding frenzy, the bass seemed to easily tell the difference between their live prey and the variety of lures being tossed at them. I plowed through my tackle box, trying a number of different lures before finally tying on a Snag Proof Minnow. This is a soft plastic lure with a hollow body. I chucked the Snag Proof Minnow and jerked it erratically, like a fleeing and disoriented baitfish. Wham! One of those genius San Diego largemouth bass fell for it. I reeled it in, took it off the hook and slid it back into the water. I repeated this sequence many times while jaws dropped in the boats around me. Many of the other fishermen were throwing more realistic looking lures than the Snag Proof Minnow, yet the bass refused to bite their plugs and bashed mine. Why they behaved this way was a mystery to me for some time. Years later I spoke of this episode to Ken Cook, a professional bass tournament angler who used to be a fisheries biologist. Cook thinks the bass have senses in their lateral line that we can’t comprehend. The fish may possibly be able to sense (similar to sonar?) whether their potential prey has an air bladder inside of it. Baitfish have air bladders but most lures are solid plastic, wood or metal. The Snag Proof Minnow, however, is hollow, possibly mimicking the air bladder of a real baitfish. Rationalizing how a fish senses and reacts to things is probably a foolish exercise. However, Cook’s guess sounded viable to me — so much so that I’ll usually include a void space in the lures I use when fishing in heavily pressured waters. Our fishing pressure has made the San Diego bass “smart”. This is “unnatural selection” in action. Okay, we’ll get back to something visual storytelling or design related next week.